Fireside Lodge | The best smallmouth bass fishing in Ontario! 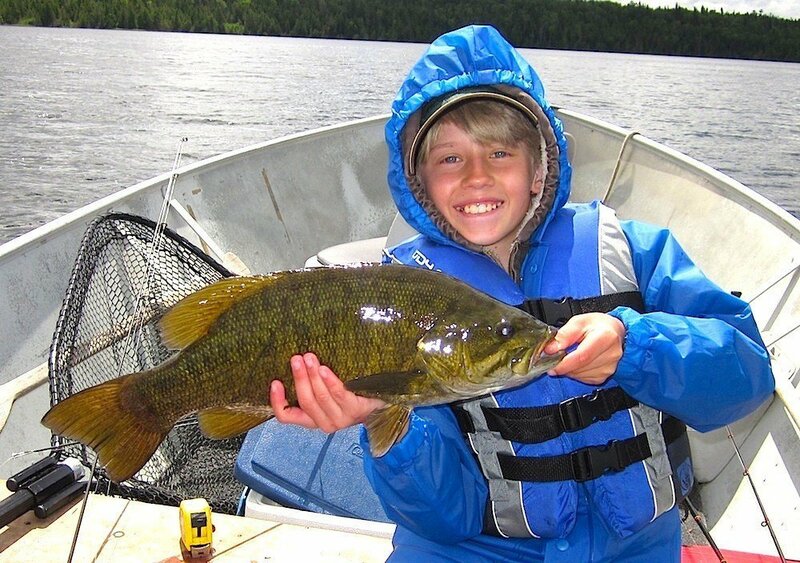 This page is written to give you a better understanding of the different seasonal fishing stages along with Smallmouth Bass movements during each stage on Little Vermilion Lake System throughout our open fishing season, and how Smallmouth Bass reacts during each stage. The information below will explain where Smallmouth Bass locate during the different seasonal fishing stages, then applies past knowledge of fishing techniques, lures, flies, and presentations, which have proven to be successful during each seasonal fishing stage. Please read this information and contact us if you have any further questions. 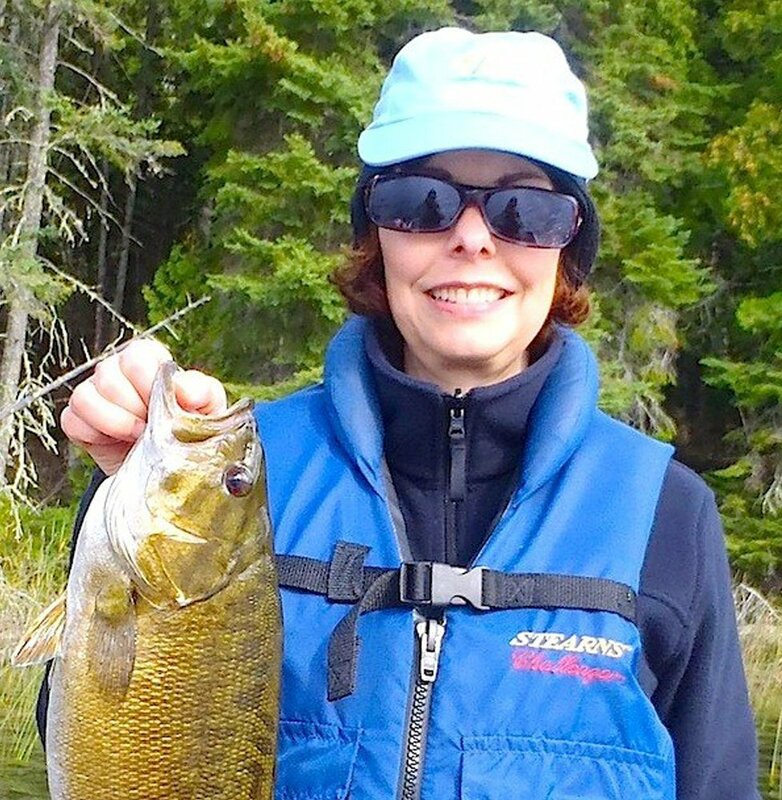 Hopefully after reading the information below you will want to take part in the fabulous Smallmouth Bass Fishing available on Little Vermilion Lake System. Enjoy and hope to hear from you in the near future to help plan your next fishing trip to Canada. Fishing at Fireside Lodge is catch & release, which ensures guests of Fireside Lodge will have a fabulous fishing experience. This stage starts at ice-out, normally May 5th-10th, and goes to June 1st to 15th, exact dates depending on the water temperatures. As the ice goes out the Smallmouth are still in their winter locations, which is 15 to 40 feet of water around main lake rock reef structures with deep-water access. 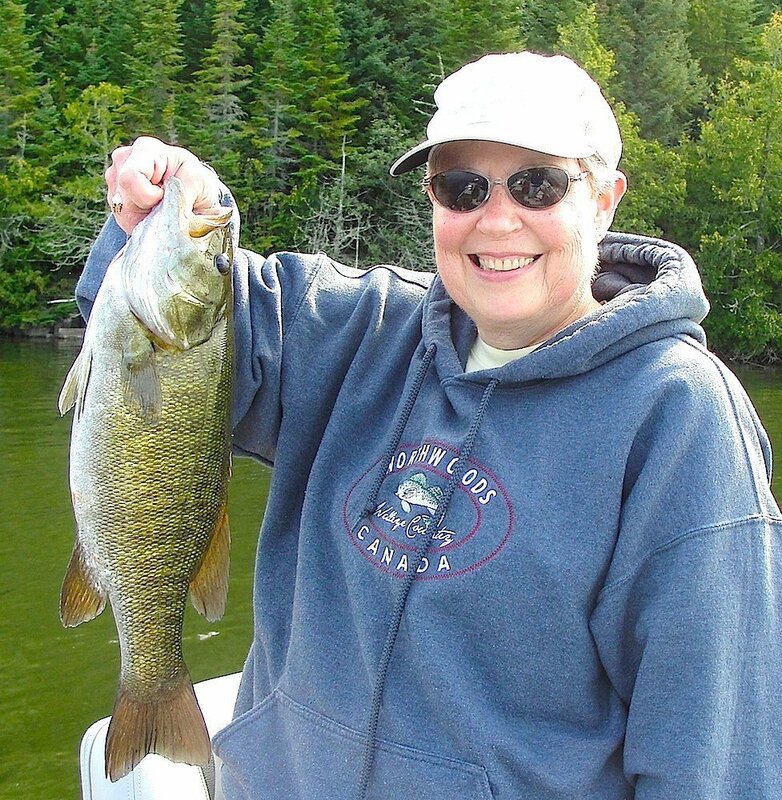 Opening day at Fireside Lodge normally has the Smallmouth Bass located on rocky lake points and rock-reefs, which hold food, cover, and bring them close to their spawning grounds. 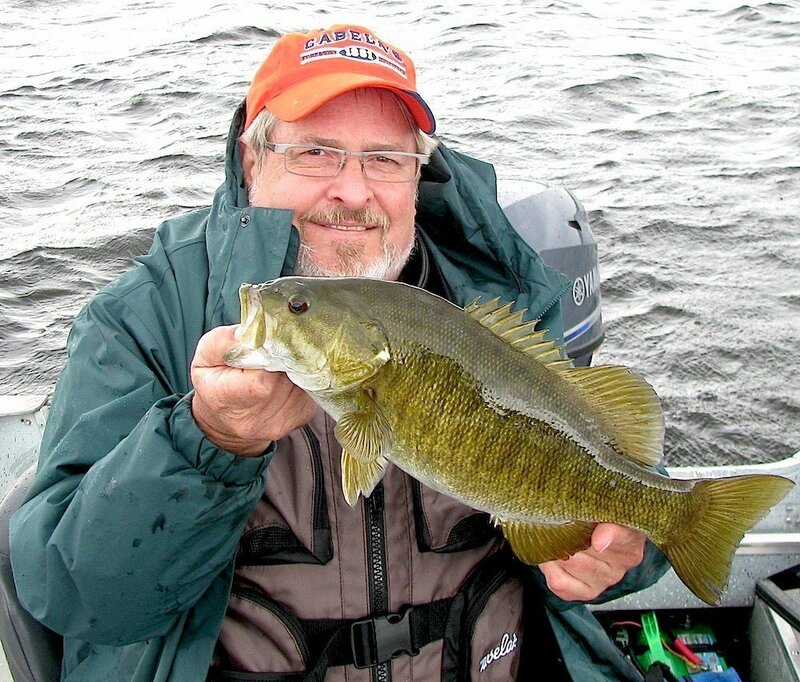 Smallmouth Bass can be caught on a variety of presentations and lures. Shallow crank baits, twitching lures, plastic body baits, in-line spinners, and jigs have all been successful. Fly-Fishers will find flies imitating minnows, crayfish, or insect patterns productive, and good to have both floating and sinking line to cover all fishing locations. Presentations that work will vary anywhere from an erratic twitching motion, to a do nothing approach. Flexibility is important for any Smallmouth fisher during this fishing stage as the Smallmouth Bass location and feeding habits can quickly change. Adapting to changing conditions and fish locations will bring more success. From our tackle shop we will do our best to give you the most current information on Smallmouth Bass, to make your Smallmouth Fishing at Fireside Lodge successful. This fishing stage produces many numbers of actively feeding Smallmouth Bass, and many Trophy Smallmouth Bass are caught, with the females being full of spawn and very heavy. Smallmouth Bass spawn starts with the nest building process and is triggered with water temperatures near 55F or 12.8C. Actual spawning takes place as the water temperatures approach 59F or 15C, and most egg deposition takes place when the water temperatures are between 61F or 16.1C to 65F or 18.3C. The dates when the spawn take place can fluctuate from late May to the third week in June. We would consider the start of the spawning process taking place from June 4th to the 8th normal. Smallmouth Bass will use traditional spawning locations every year taking place in hard bottom areas with a mixture of sand, rock, and boulders. Smallmouth Bass will make their nest under a tree or against a large boulder to provide protection and cover during the egg guarding process, which lasts about two weeks. The nests will look like an oval or circle of very clean gravel at the bottom of the lake. It can appear as a light or dark area depending on the type of gravel, the key is the gravel is clean and free of all bottom lake silt. 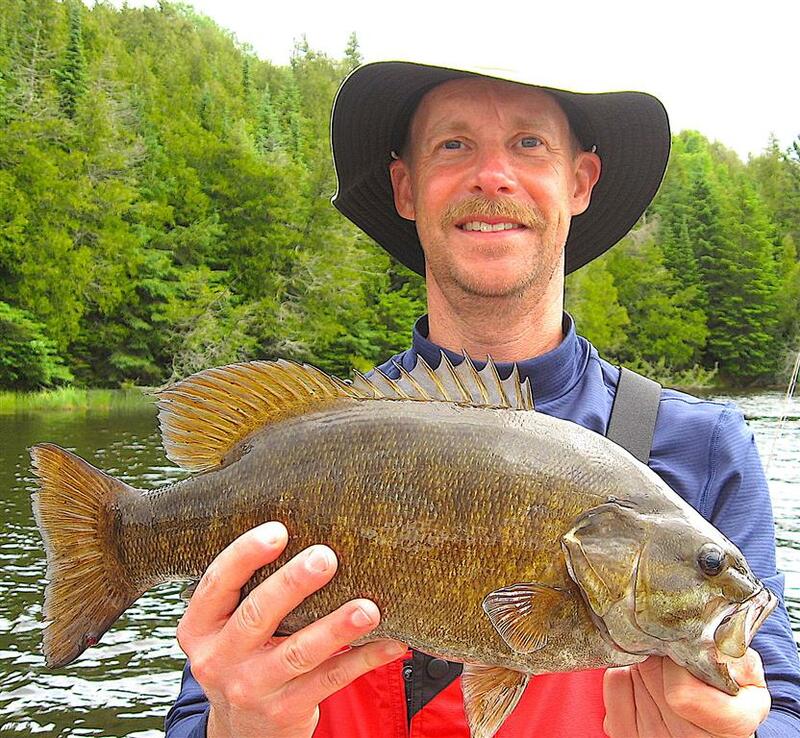 Little Vermilion Lake System has hundreds of spawning areas, which is why we have a fabulous Smallmouth Bass population. 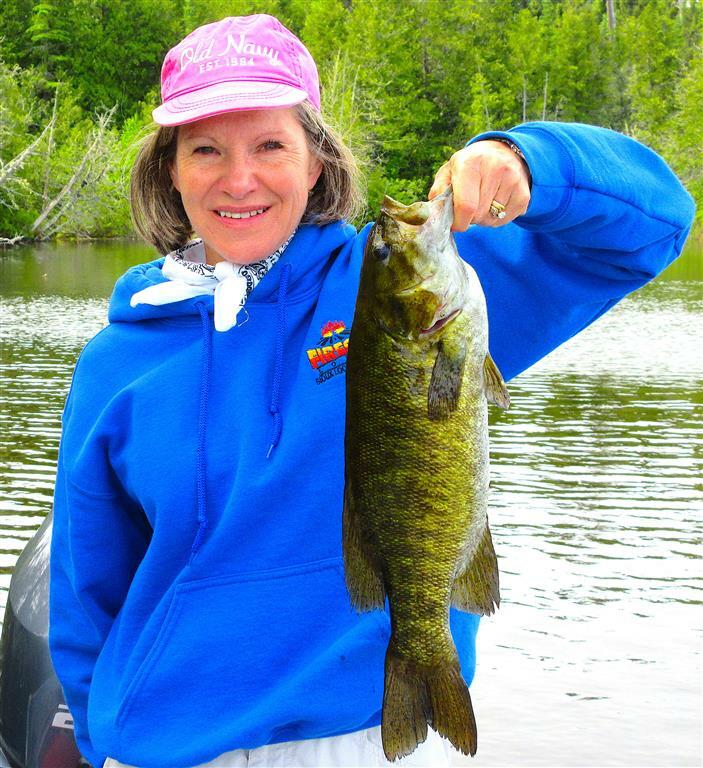 When spawning Ladies Smallmouth Bass Fishing at Fireside Lodge Canadatakes place most of the lake population can spawn within 24 hours. Some spawning grounds are early areas with some being late areas depending on sun exposure and how close the spawning area is to the colder main body of water. When the spawn is over females move off to slightly deeper water near structure, or a simple depth change. These spawned out females will stay in the same area for a while slowly feeding to re-gain strength. Males will guard the nest until the eggs hatch, and continue to guard the newly hatched fry until they consume their yolk sack. Then the last task the male leads the fry to nearby cover, which could be a weed-bed, rock shoreline, dock, or any other structure. At this point Smallmouth Bass fry will feed on plankton and just try to survive in the available cover. Smallmouth fishing at Fireside Lodge during the Spawn Stage will be along shorelines with bottom type of hard bottom areas with a mixture of sand, rock, and boulders. Lure types can vary from jigs, crank baits, soft plastics, twitching baits, in-line spinners, spinner-baits, and surface lures. Fly-fishing is fabulous with manyKid Fishing Trophy Smallmouth Bass at Fireside Lodge in Canada types fly patterns representing a nymph, crayfish, minnow, leech, and small poppers being successful. When selecting lures or flies while targeting male Smallmouth Bass protecting the spawning beds, remember that they are attacking the lures & flies aggressively because the Smallmouth are trying to protect it’s eggs or fry not actually foraging for food. Five to six days after the spawn takes place the presentation can be fast, however after that time period the males get tired and are less aggressive. At his time a slower presentation, using pausing techniques and sometimes completely stopping your lure or fly in the area is most productive. If using a fast presentation at day 5-6 after the spawn, your lure or fly will often be ignored as the male bass just follows it slowly until it exits it’s protective zone. The fishing action during the spawn stage is usually fast and furious. 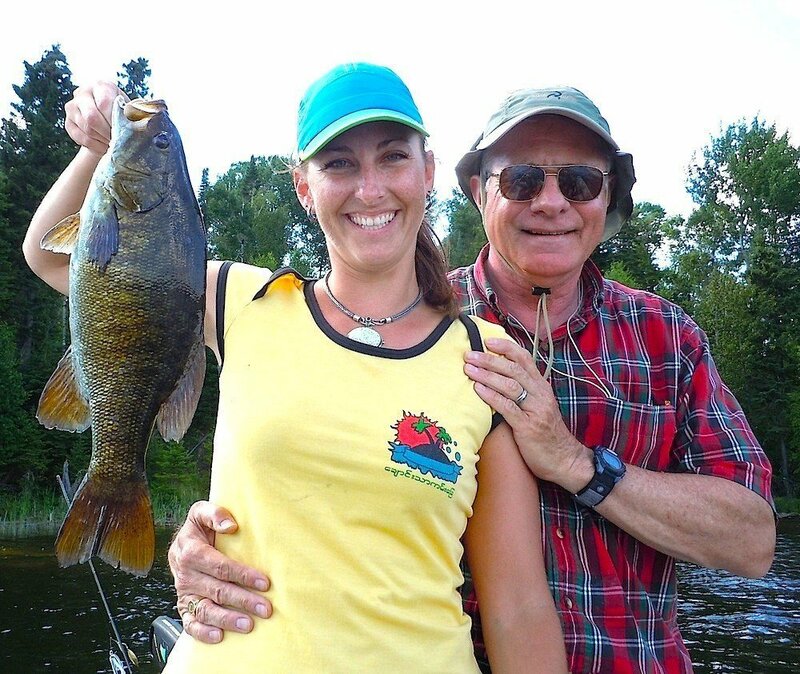 Expect to catch many males Father Daughter Smallmouth Bass Fishing in CanadaSmallmouth Bass in the 14 to 18 inch class. If you decide to pursue the largest trophy females who have spawned out you will fish just off the spawning areas near the first available structure. The most successful presentation for fishing these monster female Smallmouth Bass is a slower jigging technique. The choice is all yours. Important Smallmouth Bass spawning facts all fisher’s should be aware of when fishing during this time period are listed below. While fishing for Smallmouth Bass during the spawn the below responsible actions should be taken by all fisher’s who catch Smallmouth Bass off their beds while protecting their eggs and fry: 1) Quickly Release Smallmouth Bass as close to the bed/nest as possible 2) If Smallmouth are not released near their nest within several minutes it can result in nest failure. Predators such as perch, sculpin, crayfish, suckers, sunfish, crappie, etc. Are always lurking near the nests waiting for an opportunity to eat the vulnerable eggs or fry If the wind blows you away from the nest while catching a Smallmouth Bass, nest success will increase if you can go back to nest area to release the Smallmouth. Do this as quickly as possible. 3) Smallmouth have many spawning areas throughout the lake so fish different areas every day, and many areas during each day. By doing this you accumulate many fishing spots and therefore increase your fishing knowledge and success. If you continue to fish the same areas you will be catching the same fish protecting the same nest, which will decrease chances of nest survival. 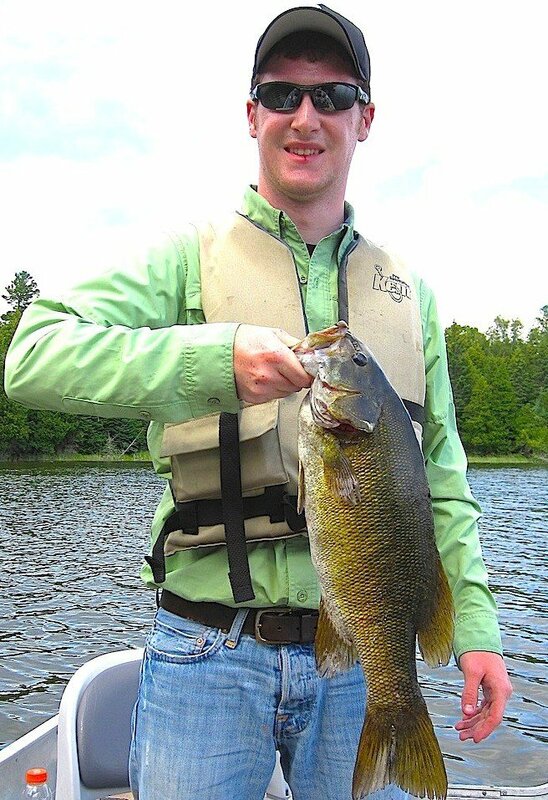 Larger Smallmouth, including trophy size fish, are mostly in a neutral feeding stage, and while in this transition they are a little challenging, but are catchable. This will last a week or less, normally between the 3rd or 4th week in June, varying by a week. This is where having five Smallmouth Bass lakes becomes an advantage. Each lake will experience these changes during slightly different times. While lake A is in post spawn, lakes B & C could be in the late spawning stage, or starting the summer stage. 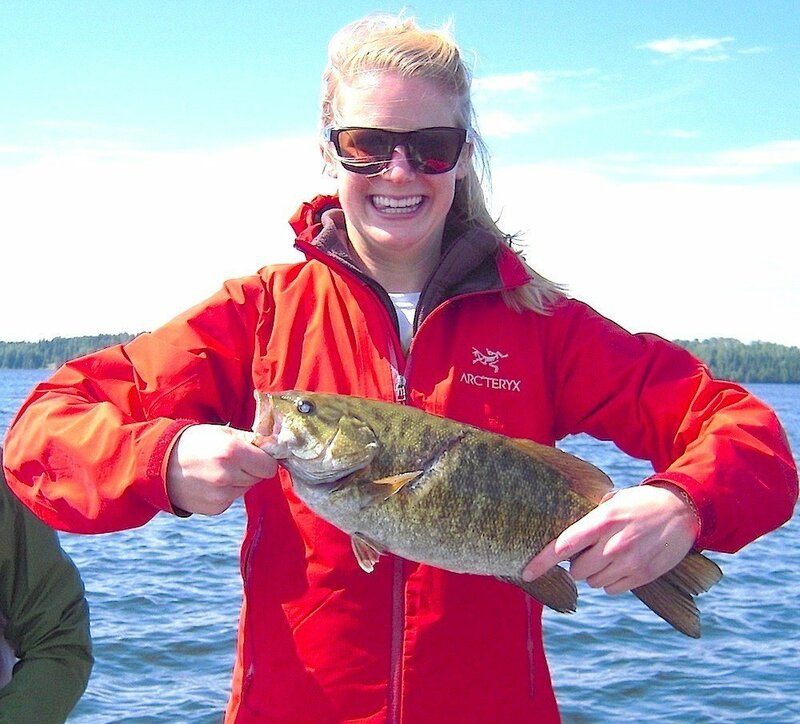 Larger Smallmouth react positively to slow presentations, more times than not. This stage starts when Smallmouth Bass are finished guarding their nests. Female Smallmouth are recovered from the stress of the spawn by now and both males & females have left spawning areas moving to summer locations. Rocky main lake points and shore related reefs are where they show up first. 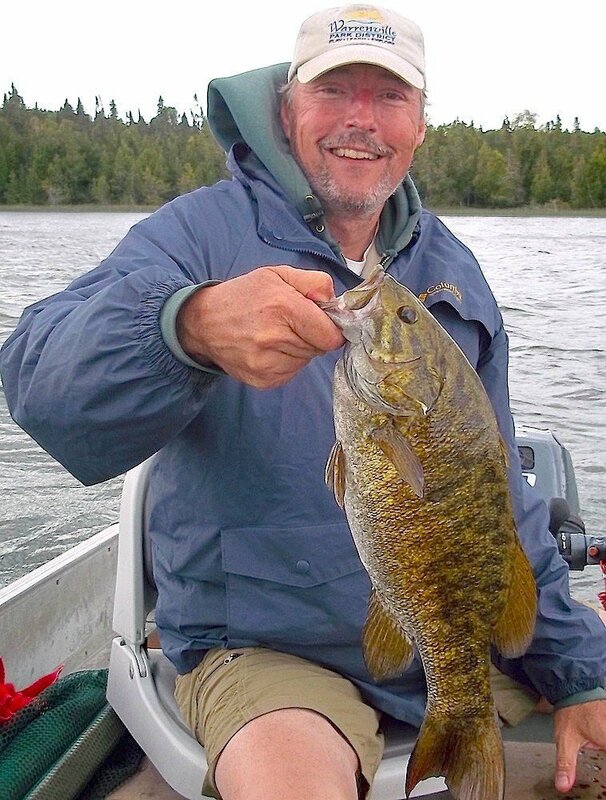 At this time the smaller Smallmouth Bass will locate on shallow rocky shorelines usually feeding aggressively, which provides a lot of fast action fishing. Smaller baits like jigging baits, soft plastic baits, live bait rigs, and in-line spinners are productive. Fly-Fishers would be recommended to use a nymph mayfly pattern, leech imitation, wooly bugger, small minnow fly with a slight flash along with a slower presentation. Using sink-tip-line seems to work well. Poppers can also be very productive and a blast for those more aggressive shoreline Bass. This fishing stage will produce some very large trophy Smallmouth Bass as the females have been done with the spawning process for over two weeks and will start to feed regularly. This stage Smallmouth Bass of all sizes start to feed very actively. They will locate mainly by lake points leading into bays, plus off shore reefs & rock structures. Also bass will be found in weeds and weed-lines. Normally between 1st and 4th of July, the Smallmouth Bass feeding switch is flipped and they start to feed very aggressively. Anglers have a blast when this happens as many lures and presentations work. Various fish/crayfish imitating crank-baits, jerk-baits, twitching-baits work great, plus in-line spinners, soft plastics, jigs, and live bait produce very well. This is also a fabulous time to fish on the surface, with lures like a Chug Bug, Torpedo, Zara Spook, Pop-R, and there are many more lures, which will all work very well. The use of lure presentation will vary from fast to slower depending on the feeding mood at the time, but Smallmouth Bass are normally agreeable during this fishing stage. If a Fly-Fisher you want to use a mix of nymphs, woolly buggers, minnow imitating streamers, perch pattern, leech imitators, crayfish, and poppers adjusting depending on conditions. 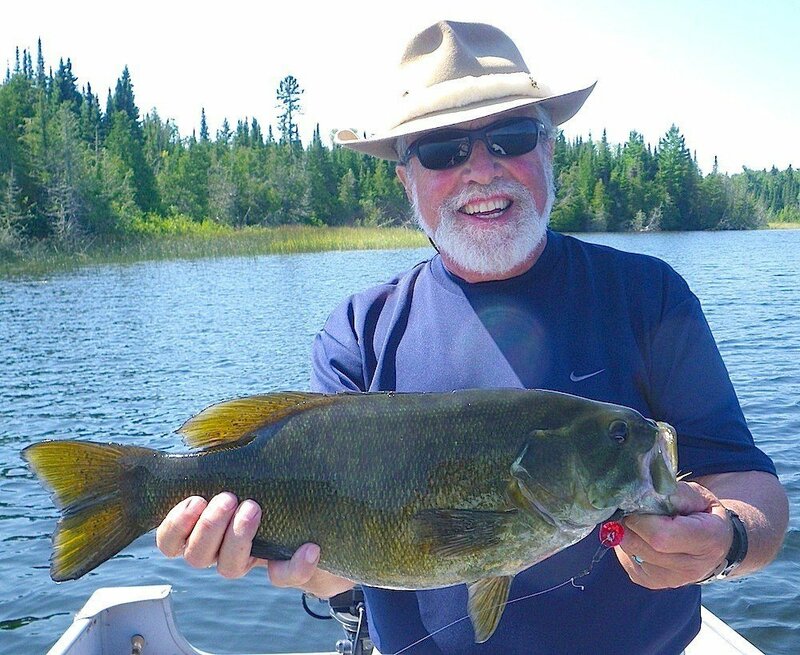 This Smallmouth Bass fishing stage brings fast action and fun for all size fish, and locating Smallmouth Bass are relativity easy with a little instruction and a good lake map, which we will gladly provide at our tackle shop in the main lodge. This Smallmouth Bass Stage spans from the 3rd week in July for about 4 weeks depending on seasonal weather changes. Smallmouth Bass can be found in a lot of the areas located during the early summer stage, however weed-beds also become an important Smallmouth Bass location at this time. Weeds during this stage increasing develop and become fully grown. This provides a perfect environment for baitfish, as it provides food and cover. The baitfish and cover will also attract Smallmouth Bass, and they will sometime inhabit these weed-beds in large schools to take advantage of the excellent food supply. Best weed-beds are big, reaching out far from shore and having several definitive break lines until finally breaking off into deep water. Having a few rock bars or points and some rocky shoreline extending into the weeds make it a perfect summer stage location for Smallmouth Bass. These areas are Trophy Smallmouth Bass magnets as they provide an endless amount of food with fish having to expend minimal effort to feed. Optimal fishing depths range from 6 to 14ft, and because of the large amount of food available, varying presentations are needed to keep fishing success consistent. 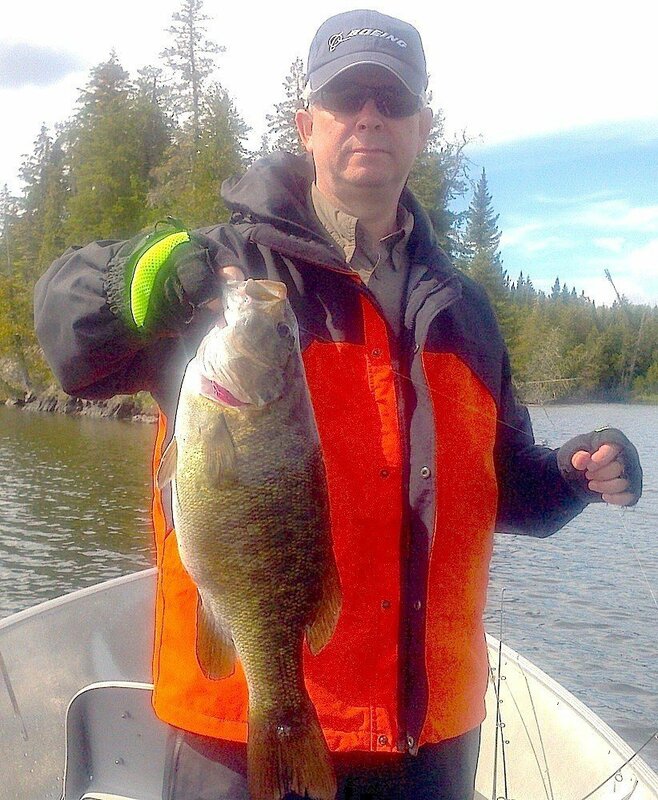 Use of fast aggressive to slow meticulous, and surface to deeper presentations will be used Fabulous Trophy Smallmouth Bass Fishing in Canadadepending on conditions and Smallmouth Bass feeding moods. The persistent angler will almost always catch fish. Being that a wide variety of presentations are being used so will the lures, which can vary in use from jigs, soft plastics, twitching minnow baits, surface baits, and live bait or live bait imitators fished wit a Carolina style rig or drop shot rig. Fly Fishing flies and presentations will vary from slow, using sink tip line, to surface popping, or stripping a minnow imitator over the top of the weeds, (see our 22 minute video on our YouTube channel for some great Smallmouth Bass footage using this method). Having a variety of flies imitating a crayfish, minnow, or a leech, and fishing with poppers, divers, and gurglers can be successful. Some of the Biggest Trophy Smallmouth Bass are landed at this time of year. From our tackle shop we will help you locate these prime Smallmouth Bass summer stage areas, and then the rest of the fun is yours. 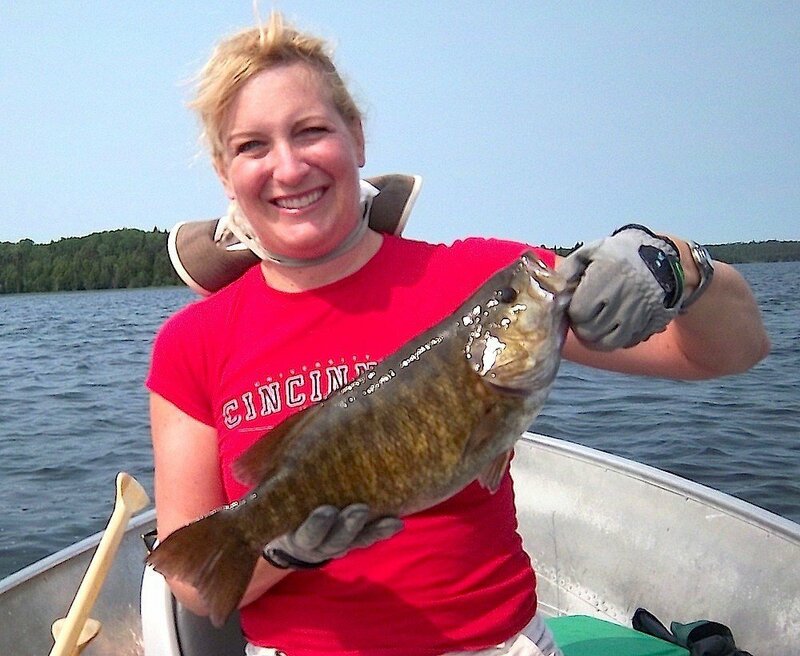 This Smallmouth Bass fishing stage takes place between late August through late September. Smallmouth Bass are caught in the locations described in the summer and early summer stages above with some slight changes happening throughout this stage. As we move through this stage the main lake points leading into bays, weed-line breaks, shorelines with ledges leading into deep water, and reefs around deep water, especially ones near the weed-beds, become more important. Presentations will also change with changes in water temperatures, and as the water temps drop the use of more subtle techniques are needed. Paused or stop and go actions with suspending lures work, and jigging with soft plastics or live bait using a drop-shot rig or Carolina rigs can be very productive. On the Fly-Fishing end of things the Summer Stage patterns & techniques will work very well, and the need for sinking tip line with a slower presentation becomes more valuable for success as the water temperatures cool. If the water temps do not change then neither will the presentations. 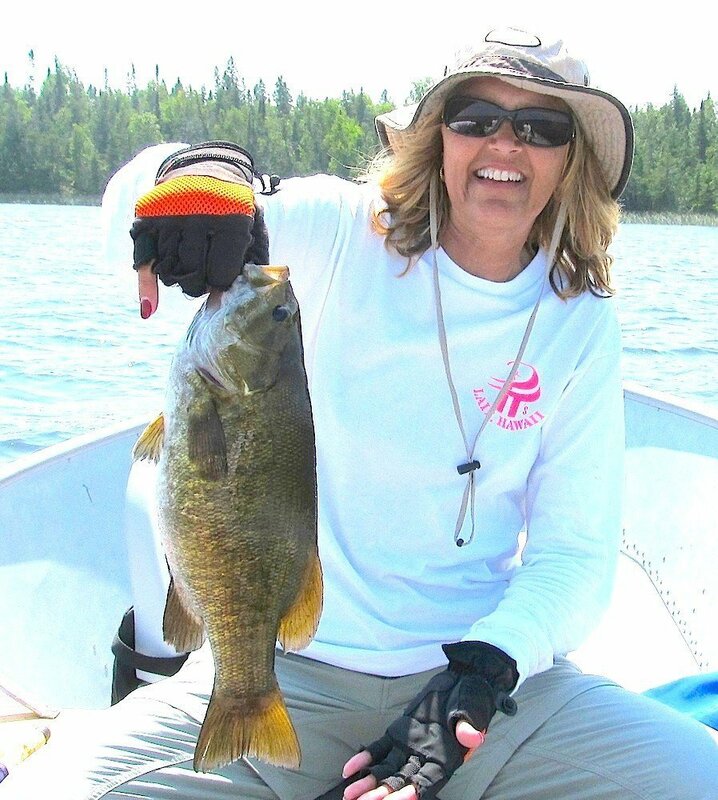 During this stage the Smallmouth Bass are feeding in preparation for Women Fishing Trophy Smallmouth Bass in Ontario Canadathe late fall and winter months, and as the water cools down so does the Smallmouth’s metabolism, and hence a slower presentation brings better results. 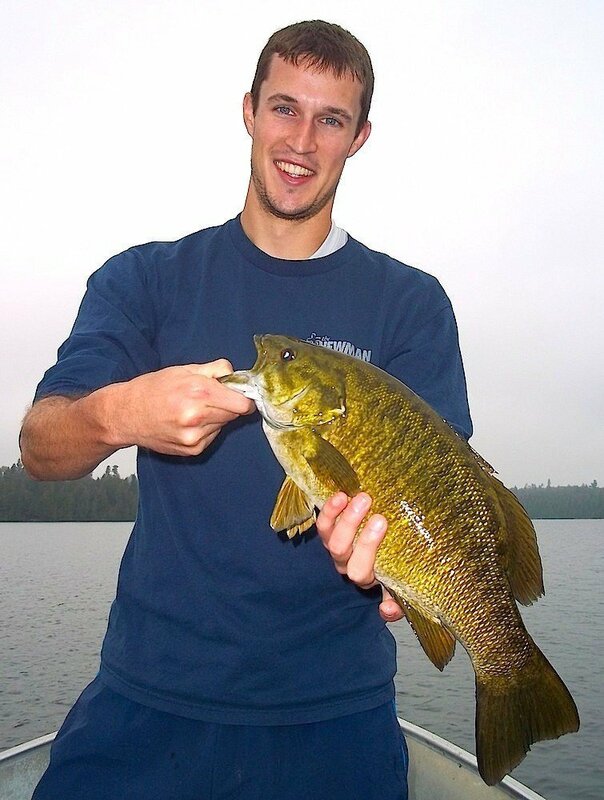 Many Big and Trophy size Smallmouth are caught during this fishing stage. This is also a beautiful time of year having cooler nights, migratory birds start to gather and move, and some noticeable color change starts to take place in the trees and marsh areas. Being successful is all about being out on the lake fishing and having some knowledge of Little Vermilion Lake system. We will provide you with the knowledge every day at our tackle shop in the lodge. 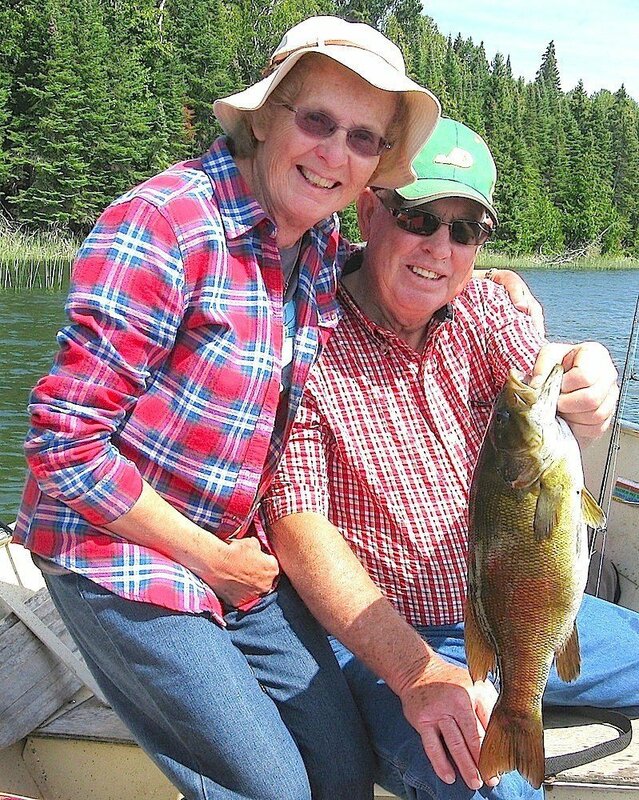 We are available twice every day to give advise based on over 2.5 decades of knowledge, developed by following the seasonal movements and fish patterns of Little Vermilion Lake.